It has been a pretty good summer here in Britain (by our standards at least), and people have been flocking to beaches along the coasts to play in the sand and sea. 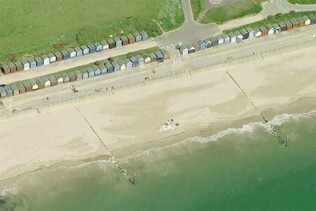 In select areas a lucky few can take advantage of beach huts – small permanent cabins which line the shore. Despite their diminutive size and basic facilities, in prime locations huts sell for prices higher than many people would pay for a house. 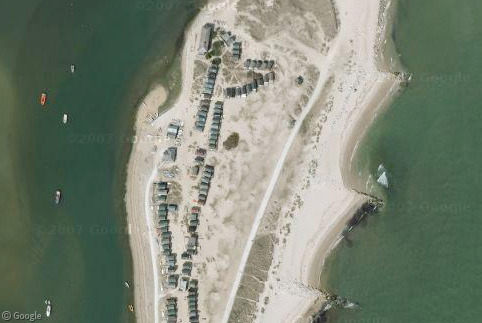 This is the case in Mudeford Spit in Dorset, where a hut sold last year for £170,000 – claimed to be the highest price ever paid for a beach hut1. That astronomical amount (equivalent to about $260,000) got the buyer a wooden structure 5.5m x 3m (18×10 ft) with a small kitchen but no hot water or washing facilities, located a 30 minute walk from the nearest road. It sleeps six (overnight stays are permitted from March through October) in small beds, including some in the upper level accessed via a pull-down ladder, and it also has electricity from a solar panel on the roof. More details can be found in this Guardian article. 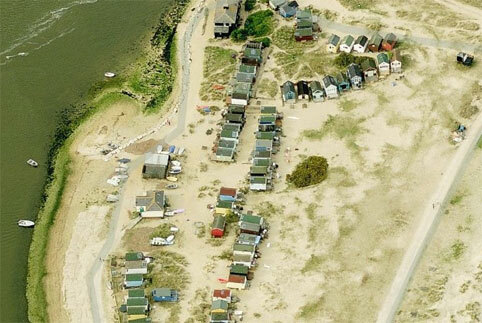 However, in July a hut on Mudeford Spit eclipsed the previous sale when it was listed for £200,000. The 350 huts here are prized for their isolated location along a sandbank which protects Christchurch, with views of the harbour on one side and the open sea to the other. 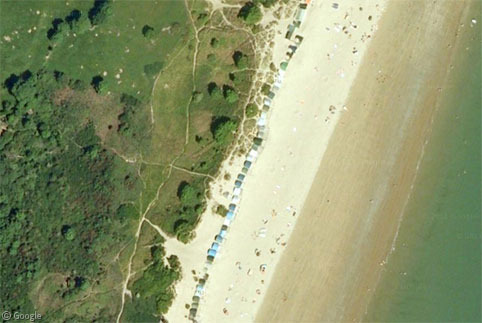 Bing’s Bird’s Eye view gives us a close-up look at many of the huts. Beach huts are believed to have been first built in Australia in the mid-19th century. By the early 20th century simple seaside cabins were being built in Britain, intended to be affordable holiday homes for the working class. Within a few decades they had become sought after by the middle and upper-classes2, making them unaffordable for their intended occupants. During World War II all beach huts were shuttered, but when reopened after the end of the war their popularity only increased. Today an estimated 20,000 to 25,000 beach huts are found around the country. Some of England’s earliest huts were built in Bournemouth, just to the west of Mudeford, and the beach is still lined with hundreds of them. While some are privately owned, many are are available to rent for a day, week or weekend. These basic structures come with “four deck chairs, a gas ring and curtains”, and no overnight stays are allowed (not that there’s room for a bed in there anyway). The view shows why they are so popular as a place to have lunch, make a cup of tea, and perhaps take an afternoon nap. 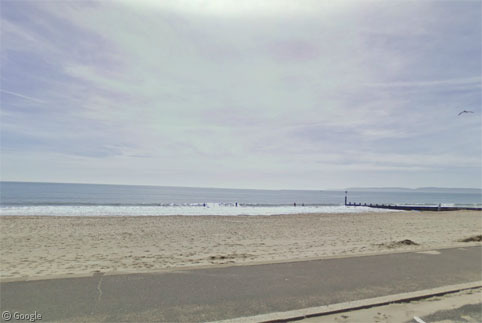 Nearby Boscombe has a wide range of beach hut styles, from simple wooden structures sometimes on two levels, or dwarfed by modern resort development, to 1950s concrete structures, recently renovated as popular ‘beach pods‘. Meanwhile, occasionally Street View allows us to take a peek inside a couple of huts to see just how tiny they really are, and just how much stuff people can cram into them! 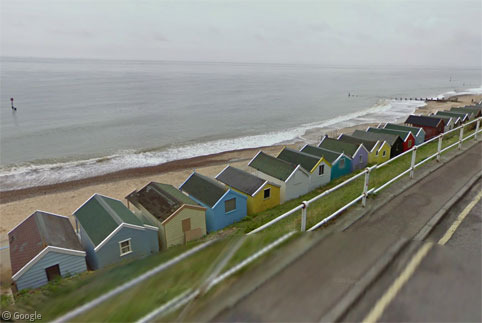 On England’s east coast, some of the most expensive beach huts can be found at Southwold in Sussex, a small town popular with holidaymakers from London. Huts regularly sell for more than £100,000 and dozens of people are on a waiting list to buy one. A couple of years ago, the last surviving original century-old hut was on sale for £60,000 – even despite it’s age and the fact that it’s much smaller than the newer huts which surround it (though the cost did include some folding chairs and small table). 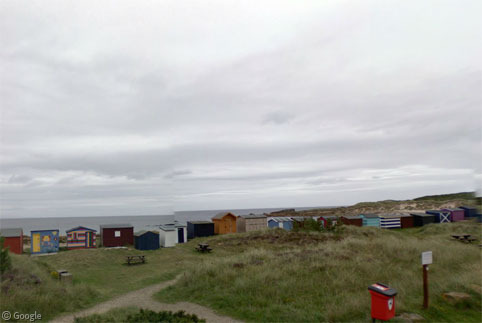 Beach huts are even in high demand in northern Scotland, where the weather may be less tropical than England’s South coast, but you can apparently watch dolphins swim past from the forty four colourful beach huts in Hopeman, where there is apparently a 10-year waiting list to purchase a hut. 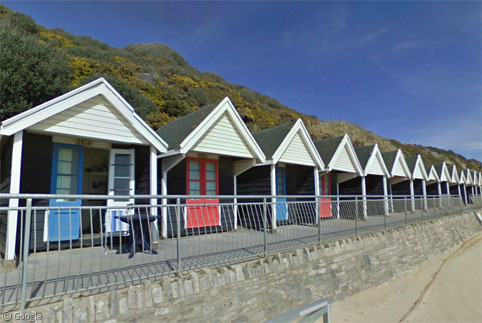 In Wales, some of the priciest beach huts are found along the beach at Abersoch. In addition to long waits to purchase a hut, some people go to extraordinary lengths even to rent them. Back in Dorset, at Avon Beach in Christchurch only two huts of the several dozen huts are available for long-term rent. Last year a family camped out for 5 days in mid-winter to secure one of them for the summer. Finally, while beach huts appear to be idyllic, the relentless tides can – over time – threaten their locations. 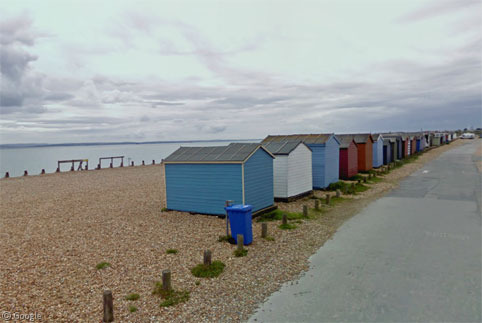 A number of huts on Hayling Island’s West Beach have had to be relocated to allow for the reconstruction of sea defences. 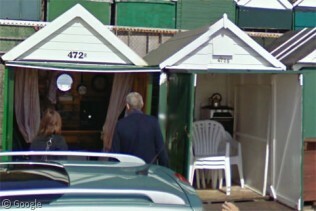 Why do beach huts in Bournemouth have a “VISITED WALES” stamp? The site automatically picks one of the locations in an article and uses that for the stamp. It could have just as easily been England or Scotland, but Wales got picked this time.